UPDATE March 5, 2019: Crazy 8 has closed completely and does not have an online store presence anymore. UPDATE January 23, 2019: Both Gymboree and sibling brand Crazy 8 stores are closing. It was announced that Gymboree filed for bankruptcy on January 16th (see reference 1). Originally, in December 2018, Gymboree – parent company to Crazy 8 – announced in a press release that they would be closing only their Crazy 8 clothing stores (see reference 2). In a new press release of January 16th 2019, Gymboree announced that the closings extend to its Gymboree brand too (see reference 3). All Crazy 8 and Gymboree physical store locations will close. The GymBucks and Gymboree Rewards programs have been stopped. Fancier sibling brand Janie and Jack is expected to be sold to another company and is expected to continue to run under that company. The online platform for Gymboree is also expected to be sold, but at this point it’s not yet clear if the online version of Gymboree will continue to run under the new company. U.S. Polo Assn. Not to be confused with Ralph Lauren Polo, the U.S. Polo Assn. has plenty of styles that are in keeping with the look and feel of Gymboree. As a bonus, their price point on some items is actually lower than that of Gymboree. art & eden. 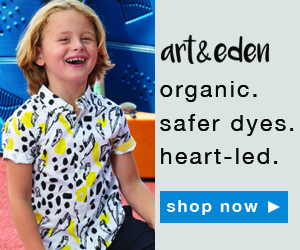 It’s about more than organic sustainable clothing – besides being socially and environmentally conscious, art & eden has eye-catching styles that fans of Gymboree will love. I can attest that art & eden fabrics are noticeably softer and more comfortable for kids than standard non-organic clothing. OshKosh B'gosh. This iconic brand has high quality styles and comes at a surprisingly low price point when there are is a sale going. Cookie's Kids. If you enjoy brand-name recognition, then you’ll like Cookie’s Kids. It’s like Overstock, but just for children’s clothing. I shop there often, and it’s a great place to find brand-name clothing for your kids – and at prices that are often much lower than the equivalent product at Gymboree. If you love the free-spirited look of Crazy 8 and its nice low price point, then you also have some awesome alternatives. First off, Cookie's Kids, which I just mentioned above, comes at an attractively low price point, considering they sell brand name overstocks. I was able to get a brand name ski jacket for my child for under $30 from there. The Children's Place. Here you’ll find superb range of exciting styles and a great choice of colors. The site comes with plenty of deep discounts, taking the average price point down lower than that of Crazy 8. Old Navy. Besides children’s clothing, you can also shop for men’s and women’s styles. If your child loves a fun, casual look then Old Navy is a great option. Steve Coogan, January 17 2019. Children’s clothing retailer Gymboree files for Chapter 11 bankruptcy protection. In USA Today. Gymboree Group Inc., Dec 2018. Gymboree Group Commences Strategic Review Process to Reposition Company. In CISION PR Newswire. Gymboree Group, Inc., January 16 2019. Gymboree Group Files Voluntary Chapter 11 Petitions in U.S. and Intends to Seek Protection under BIA in Canada. In CISION PR Newswire. Crazy 8 FAQ’s, in Crazy8.com. You heard it first at GoodKidsClothes.com - where children's clothes shouldn't cost the earth!